So how many times have you visited the Walt Disney World Resort? Maybe you haven't been yet or you've just got one or two trips under your belt, in which case everything is new and you've literally got the whole "World" to explore. Perhaps you've been a Disney vacationer for some time and you've run out of fingers on which count your visits to the Happiest Place on Earth. When you get to that stage, you find yourself repeating a lot of things. Let's be honest, there are just certain rides that you have to go on every time you're there and certain shows that you must see, but what about new experiences? Look in your PassPorter Walt Disney World guidebook and you'll see that the PassPockets, designed to keep everything together for your trip, have a space for memories of each day and, included in that, is a reference to what you tried and the result. You know when you can't find anything to write in that section that maybe, just maybe, you're spending too much time on the old favorites. After all, let's be honest, Walt Disney World covers more than 40 square miles and I don't think any of us can honestly say we've spent enough time there to have seen everything that the resort has to offer. So where can you find new experiences? The simple answer is everywhere. Whenever we head to Disney, I always try and find something new to enjoy every day. The first thing most of us decide on when planning a vacation is where we're going to stay. Is there a hotel you haven't yet stayed at on Disney property? It's my mission to enjoy every Disney Vacation Club resort and we're trying two more that are new to us in December -- the Boardwalk Villas and Animal Kingdom Villas. Maybe once we've stayed at all of them (hopefully next year! ), then we'll move on to spending one or two nights at some of the other resorts. Wouldn't it be fun to say you've stayed at every Disney resort at least once? Then there are the parks. It's amazing when I hear people say that they've been to Disney lots of times, but never discovered an attraction that's been there all along. These days, I'm trying to check attractions off my list and although there will be some I can't ever see riding - Rock'n'Roller Coaster is one that comes to mind - we're getting there with every vacation. One of the lesser known attractions is Tom Sawyer Island in the Magic Kingdom. If you haven't taken a raft ride over there, you should make some time to do so, as it's a great place to explore and has plenty to enjoy. Other places that fit into this category include Innoventions over at Epcot and Rafiki's Planet Watch at Disney's Animal Kingdom. Or what about the Swiss Family Treehouse? You can't miss it, looming over Adventureland, but have you ever headed up there to see what it's all about? Understandably, thrill seekers head straight down Sunset Boulevard to visit their favorites at the Studios and it's fair to say that some of the attractions are hidden away, such as the Magic of Disney Animation, One Man's Dream and Sounds Dangerous. The last one is on my personal list to try out on our trip in December. Don't forget the parades and shows. It never ceases to amaze me how many people have yet to see all the afternoon parades and nighttime shows. This is Disney and every piece of entertainment they put on, be it fireworks, parade or show, is worth seeing at least once. If you really have seen everything in the parks that's performed "on stage," maybe it's time to head backstage with one of the numerous behind the scenes tours that Disney offers. There's something for every taste from riding Segways in Epcot, to visiting the tunnels underneath the Magic Kingdom or the animal care areas at Disney's Animal Kingdom. Then there are the restaurants. Outside of major cities like New York and London, you're unlikely to find a better selection of places to eat. Dining at the various resorts can give you the opportunity to explore them and find out what they have to offer. How about heading over to Olivia's at Old Key West for lunch or dinner and hiring out a boat to explore the river down to Downtown Disney for an hour or so? Maybe a dinner at one of the restaurants at the Grand Floridian, timed so that you can watch Wishes before or afterwards from the resort marina. It's a totally different perspective to seeing it in the park. Or perhaps head for the BoardWalk to eat and then enjoy the street entertainers outside. Then there are the parts of Disney that not everyone takes time to visit. Many people head straight for the four main theme parks, with some time for shopping at Downtown Disney thrown in for good measure. There's more to Downtown Disney than just browsing the stores, with eating options, Cirque du Soleil's show La Nouba, DisneyQuest, a range of clubs at Pleasure Island and even boats to hire at the Marketplace. And speaking of water-based activities, don't forget there are two water parks, Typhoon Lagoon and Blizzard Beach to enjoy, along with Disney's Wide World of Sports. You may have heard of all the championship golf courses on Disney property, but if you're not up to that level, then there are also two miniature golf courses, Fantasia Gardens near to the Swan resort and Winter Summerland next to Blizzard Beach. In fact, the sporting opportunities at Disney are endless, with tennis courts and health clubs at several of the resorts. And if you'd rather have an easier life -- I mean you're on vacation after all -- then why not head for one of the two spas at the Grand Floridian or Saratoga Springs or get a massage at one of the health clubs? 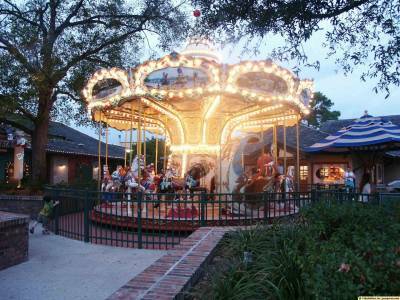 Some of the resorts, including Port Orleans and Saratoga Springs, even offer horse-drawn carriage rides, which offer a unique way to see the hotels. The options really are endless at the Walt Disney World and there's no excuse not to try something new. If you're short of ideas, then take a very careful look at your PassPorter. The chances are everything you could possibly ever think of doing at Disney is covered in there somewhere. It just takes a bit of courage to move away from the old favorites and enjoy new experiences. This article appeared in our October 25, 2007 newsletter -- subscribe to our popular newsletter today for free!